With three boys in school, I have quickly learned that buying trendy character backpacks is a complete waste of money. Those fun backpacks that go on deep discount at the big box stores barely last through the first half of the school year before a strap wears out or a zipper breaks. And even if they miraculously survive a school year, the odds are good that your child will outgrow whatever character is on that backpack. My experience lead me to splurge for Lands End backpacks. We had a pretty good run with our Lands End backpacks. My oldest son’s backpack lasted 4 years before a zipper gave out. His twin brother’s backpacks are still useable, but are looking pretty worn. I tried to take advantage of Lands End guarantee… but they told me that the backpacks’ condition was due to normal wear and tear. I then asked for a discount since I am a loyal Lands End customer. They did not offer one. I decided that if Lands End wasn’t interested in making me a happy customer, I was going to shop around. I spent some time researching other reliable backpack brands like Jansport and Eddie Bauer. The backpacks need to last several years (at least 3 or 4!) and be big enough to hold all my boys’ stuff. This includes snow pants and shoes in the winter months. They had to be well-constructed and be durable. (Boys are tough on stuff! ) The backpacks also had to have reflective strips on them, since my kids have to wait for the bus in the dark in winter. The kids wanted lots of pockets to keep stuff organized. The backpacks also needed at least one pocket to hold a reusable water bottle. I decided that I really wanted to try the L.L. Bean backpacks. They come with a great guarantee and excellent reviews. Just one problem. To buy my three boys a monogrammed backpack in a good size would set me back about $173. Ouch. A search on eBay and a perusal of thrift shops in my area were unsuccessful. I either couldn’t find what I wanted, or the prices were too high for secondhand items. But then I remembered I had Swagbucks. I earned enough Swag Bucks to qualify for $125 in L.L. Bean gift cards. And I knew that if I could convince my mom to order them with her L.L. Bean credit card, I could get free monogramming and free shipping. My mom used Ebates, too, so that will earn $.71 cash back. After all was said and done, I ended up owing my mom just $35 for three personalized, large L.L. Bean backpacks. 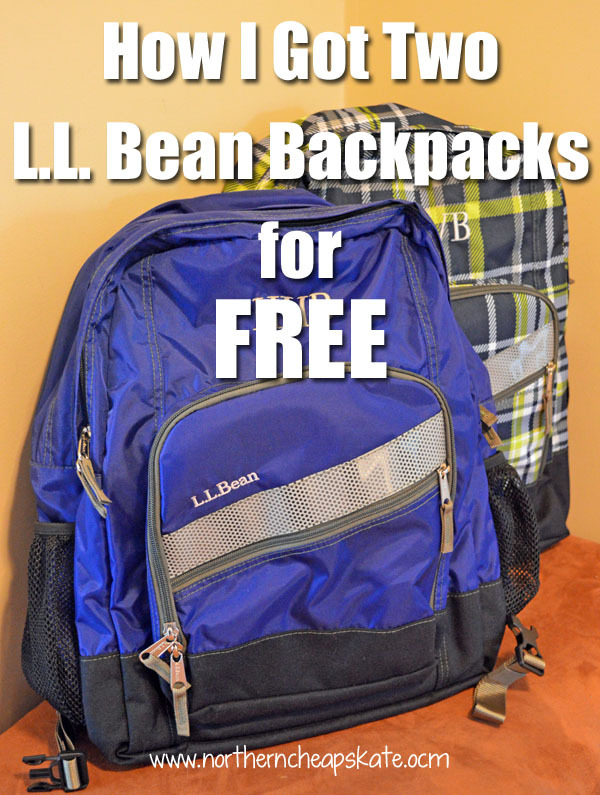 That’s like getting two backpacks for free! I couldn’t buy each of my three kids a personalized, high quality backpack for a total of $35 anywhere else. You may find some great sales on backpacks in the upcoming weeks, but remember that it’s not a good deal if you have to replace that backpack mid-school year. Focus on quality first. Then look around for discounts and use rewards programs like Swagbucks or money earned from taking online surveys to help you bring the cost of high quality school gear down to an affordable price. Remember that the little things you do to save money allow you to live well for less.